With the finalization of the bicameral version of the TRAIN or Tax Reform for Acceleration and Inclusion Bill, it’s now heading to the Malacañang Palace for the President’s approval. Once signed into law, this sets into motion a comprehensive change to the country’s taxation structure, including one that governs new vehicles. As a refresher, the current excise tax for new vehicles shifted from an engine displacement-based system to a value-based system that uses the Net Manufacturer’s Price (landed cost + importation duties and taxes) or Cost of Goods Sold (COGS) as basis. This system has been in use since the late 1990s. This new version exempts EVs (for environmental incentives) and pick-up trucks (to spur the agricultural sector) while reducing the excise tax on Hybrid vehicles by half versus non-hybrid vehicles. 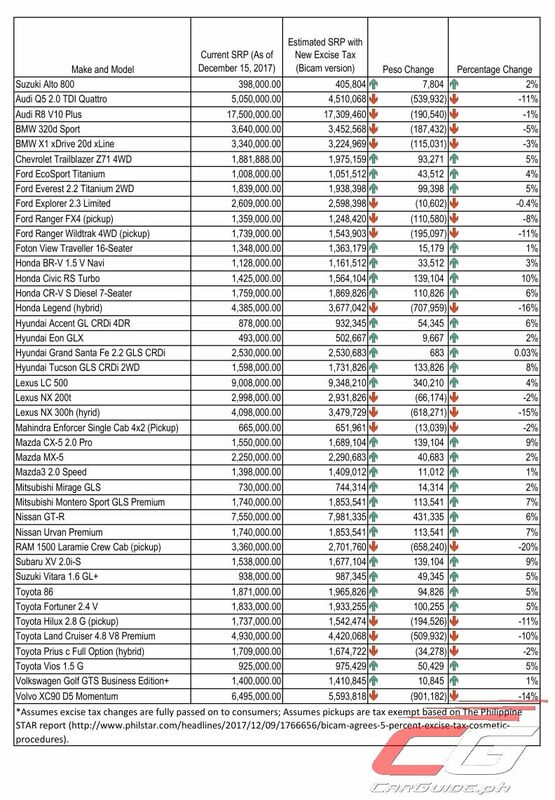 Assuming all factors aside from excise tax remains constant, it’s now possible to take a look at how TRAIN affects a sample of 42 vehicles (roughly 10 percent of the available models in the Philippines) from various price ranges. *based on global industry rates that float wholesale margin as 8-14 percent and dealer margin as 7-10 percent. Based on these assumptions, pick-up trucks definitely benefit the most with a Suggested Retail Price (SRP) that could go down by as much as 20 percent for leisure trucks such as RAM 1500 Laramie Crew Cab. Other more mainstream pick-ups, such as the Ford Ranger Wildtrak and Toyota Hilux might see a reduction of about 11 percent. It won’t be insane to think that upcoming products such as the Ranger Raptor will take advantage of this, and be priced well in the P 2.5 to 3 million range. In the hybrid category, luxury hybrids in the P 4 million-range such as the Honda Legend and Lexus NX300h will see the biggest drop in price: 16 percent and 15 percent respectively. Sadly, something more mainstream such as the Toyota Prius c will just see a meager 2 percent drop. Digging deeper and looking at two Lexus NX models: the non-hybrid NX200t and hybrid NX300h shows that even by halving the excise tax, it won’t make the hybrid cheaper. Yes, the SRP goes down by an approximately P 618,271 compared to today, but it’s still around P 550,000 more expensive than the non-hybrid version under the TRAIN. Removing all pick-up trucks, EVs, and hybrids, the approved bicameral version sees vehicles priced in the P 1.4 million to P 2 million range affected the most with cars such as the Honda Civic RS Turbo and Subaru XV 2.0i-S getting slapped with a 10 percent and 9 percent increase respectively. What’s even more surprising is how a small difference in the current SRP will have a potentially huge effect when the new vehicle excise tax comes into play. That P 25,000 difference the Volkswagen Golf GTS Business Edition+ and the Honda Civic RS Turbo results to a P 128,259 difference post-TRAIN in favor of the German. Finally, although the senate version seemed to have favored luxury vehicles over mainstream ones, the bicameral version has managed to balance this out. Plotted out in a graph, the bicameral version of TRAIN goes through multiple “waves” with peaks and troughs. As previously mentioned, the biggest peak happens in vehicles priced between P 1.4 million to 2 million. Those below P 1.4 million will potentially see just a single-digit increase (1 to 2 percent) while those priced from P 2.5 million such as the Ford Explorer 2.3 Limited (P 2,609,000) will actually see a drop in price with the trench bottom being at the likes of the Toyota Land Cruiser and Audi Q5 which will drop by a substantial 10 percent and 11 percent respectively. 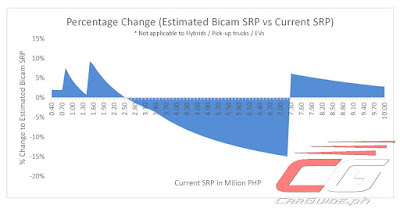 However, as the Net Manufacturer’s Price hits around P 4 million (these are the vehicles with an SRP that’s typically in the P 7.3 million range), the wave starts going up again. 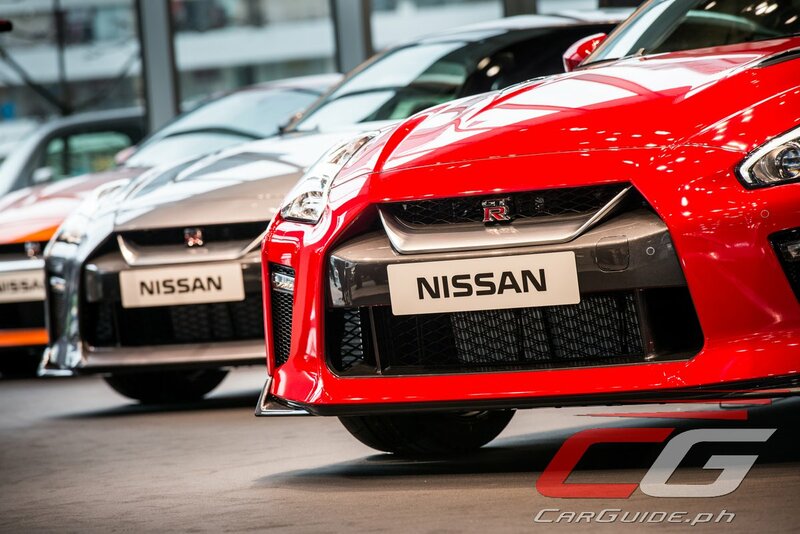 Cars such as the Nissan GT-R will be swept up the most—with a price increase amounting to 6 percent. As the suggest retail price goes up though, the wave start to flatten once more. The LC 500, which commands a P 1,458,000 premium over the GT-R, will just see an approximate P 340,210 jump in SRP compared to the Nissan sportscar, which sees a P 431,335. Meanwhile, seven-digit cars such as the Audi R8 V10 Plus will actually be more affordable under the new excise tax structure. This exotic sportscar will be P 190,540 cheaper. Without a doubt, vehicles in the Bentley, Ferrari, Lamborghini, and Rolls-Royce range will see even bigger savings under the new tax structure when compared to the current one. Based on this data, it’s clear that the bicameral version of the new vehicle excise tax will affect some car buyers more than others by the time of its implementation. If you’re thinking of buying a car in the P 1.4 million to P 2 million range such as those from Subaru, Mazda, Peugeot, and Volkswagen, now would be a great time to get that vehicle before TRAIN takes effect. These are the brands that will most likely have to adjust their SRPs to cover for the increase in tax. Same goes if you’re in the market for an SUV such as the Honda CR-V, Toyota Fortuner, Mitsubishi Montero Sport. Meanwhile, if you’re on the fence whether you should get a mid-tier Audi, BMW, Mercedes-Benz, or Volvo, it might be a good idea not to rush that purchase, especially if your finances are going to be more fleshed out by next year. The combined 14% dealer and wholesale (distributor) profit will likely be accurate for the most popular cars out there and the cheaper subcompacts. However, for the likes of the Nissan GT-R, Audi R8, Volvo XC90, Lexus, and some of the top of the line variants, 14% is just too low. The sportscars and luxury cars probably have upwards of 40% and up in terms of shared profit margin between the dealer and distributor. Other low-volume but marquee offerings (Toyota 86, Mazda MX-5, Land Cruiser V8, even the Prius) will likely also have a higher profit margin than the assumed 14%. That’s why we had to lay down our assumptions. No one knows the exact margins each particular make and model and brand would make. Car dealers like most business, will most likely feign ignorance for those models that will have lower taxes and probably just maintain the price with a little promo like free umbrella and 10 more liters of fuel. ^Which is not gonna happen... car retailers are just downright insatiable! I would have liked to have seen your estimate for the City E (current SRP is 810,000). IDK if you can use the table to check the price range of vehicles not on the list. The VW and RS turbo has a price difference of 75k but the taxes are miles apart. The Civic is a special base because it actually reached the higher tier with its net manufacturer's price. More or less though you can use the table as a guide. Hi Mr. Ang, shouldn't you, as part of the motoring media take the cudgels for the consumers and make sure that car companies adjust their prices accordingly, (lower them) based on the favorable TRAIN effect? I seem to notice that journalists covering the automotive industry tend to be very lenient. It is indeed very rare to read a scathing review on cars being sold here in the Philippines, e.g. lack of safety equipment, etc. vis-a-vis to models being sold in other ASEAN Nations. Almost or all automotive reviews remain palatable for the sake of PC and convenience. I'm not saying that car reviews should be critical per se, but it should be pro-consumer. But how can that be when they fly you to another country, all expenses paid, to witness their product launches...tsk. tsk. By the way, the comment is not meant to single you out but you must agree that all car reviews in the Philippines are too generous to the manufacturers, compared to how other motoring journalists, especially in the U.K., Singapore, and Thailand, review cars. Automotive journalists in the Philippines are really just PR extensions of the motoring firms....example "Motoring Today." There is no review, just a highlight reel of the car's features... no commentary here... These "reviews" do nothing to elevate the standards of trim and safety features of cars being sold in the Philippines and always conveniently leave it to free market economics and supply and demand to supposedly "determine" the models to be sold in the country. No offense meant. Just telling the obvious. As motoring journalists, it's our job to remain as objective and independent as possible. That's why CarGuide.PH exists in the first place and that's why you can trust my reviews. 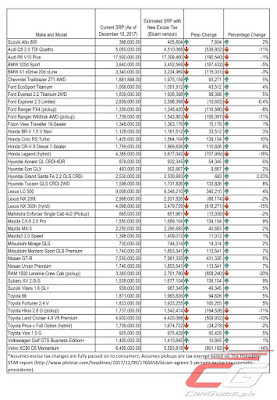 With regards to asking car makers to adjust their pricing, we have remember that the computations I made above are all based on certain assumptions. Car makers have their own strategies in mind and I'm sure they're going to fine tune their pricing when the TRAIN finally comes into effect. Some will lower prices, some will maintain them, some might even increase them. (Other forces such as foreign exchange is another factor we have to consider). Thing such as the Net Manufacturer's Selling Price is a closely guarded secret for one and I know for a fact that some may resort to under declare the value of their cars so that they'll fall under a more favorable tax bracket. In the end though, I am but one voice in this industry. I will always speak my mind, but in the end, achieving the right marketing and sales strategy along with the right price and features mix will determine whether a car sells or not. Rest assured, I'll continue to be objective in our reviews on this website. wouldn’t assumptions may mislead the buying public? It gives a close approximation of how the new vehicle excise tax will affect vehicle pricing. It’s no different when analysts give forecasts about foreign exchange or the price of fuel will be in a few months time. As long as they’re grounded on sound assumptions, then it’s fine. We never claim these to be the final prices once the excise tax kicks in. It showcases a scenario of what could be. Very good assumption with graph. Its as comprehensive as one would want it to be. May I assume also that you have the training of a statistician or a stockbroker? Guys and Uly: Isn't it INSANE to see how cars priced at 2.5 M to 7M will experience a PRICE DROP? While cheaper cars that the middle class can afford will experience the highest price increase?? These politicians are so friggin self-serving; they are the worst. Kotse nila puro Land Cruiser at Ford Explorer eh, kaya gusto nila mas mura ang mga kotse na nasa price range na to! Sobrang daya!!! Karamihan pa ng kotse ng mayaman yung magmumura! Di ba naisip ng nga self-serving politicians na yan na babaan o e exempt man lang sa tax ang mga commercial vehicles o for commercial use katulad ng van para mapalitan na ng mga operators yang mga lumang unsafe na PUVs. exempt pick-up trucks to spur the agricultural sector? kayong mga politicians nakakita na ba kayong magsasaka na naka pickup truck? rice thresher machine nga nirerentahan pa nila, fertilizer inuutang pa.
Read only SINGLE CAB Pick-ups are included in the exemptions. Double Cabs are subject to taxes... Can you confirm this? Your article indicates otherwise. Now that it already signed the new excise tax..what will happened to pick up truck? I already confused now to many articles, and dont know which one is true...i am planning to buy a pick up like ranger..
How about the Trailblazer Z71 or the Isuzu Mu-X Bluepower, what is their estimated price Mr. Ang? You can check our table. There are vehicles close to the mu-X and Trailblazer’s price range.